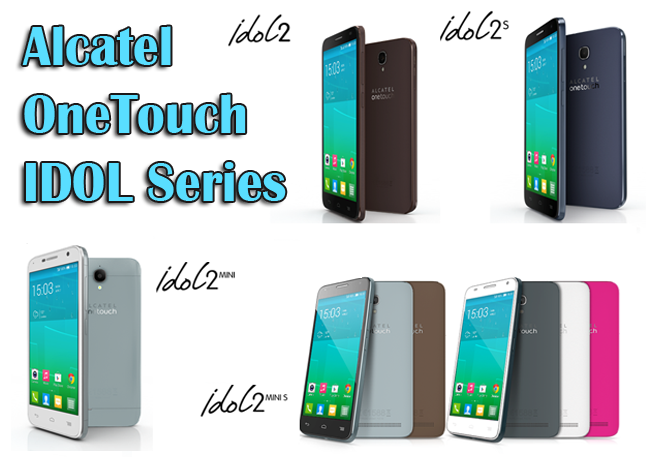 Heads up for ALCATEL ONETOUCH newest addition to the IDOL Series IDOL 2 and IDOL 2 MINI, right on the tracks of the 2013 IDOL range. Now, taking it another step the new addition to the IDOL family is now with awesome metallic design. IDOL 2 and IDOL 2 MINI are head turners with their slimness perfect to touch with its brushed metallic finishing and diamond cut complimenting Quad Core processing power and perfect IPS displays. 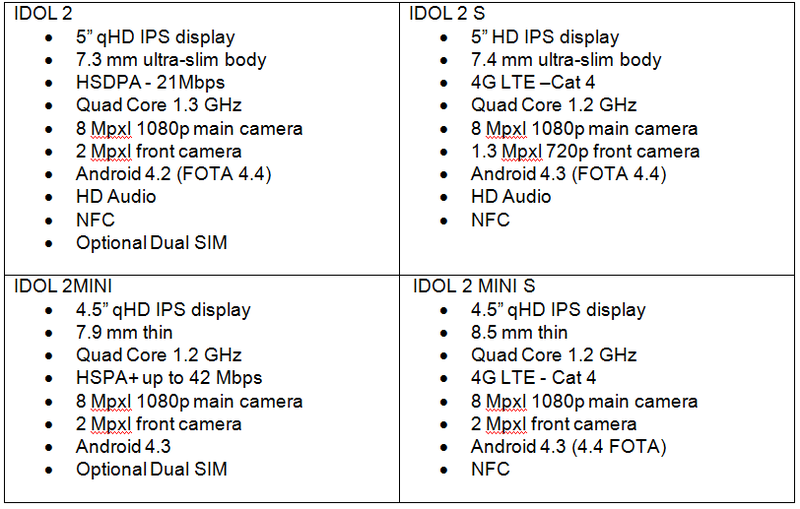 Ready to go head to head with more expensive contemporaries, both IDOL 2 and IDOL 2 MINI are armed with 8 Mpxl rear camera perfect for capturing HD videos and sharp photos through stabilization enhancements. With 5” IPS display, IDOL 2, this super thin smartphone is only 7.3 mm thin. Though thin, it can bring out bright and vivid images through its black crystal glass. Enjoy the music with dual speakers on its bottom edge. By using Miracast, sharing content to TV is made simple by only the use of a TV link. In addition to high end 4G LTE version, IDOL 2 S brings out the stylish in you with luxurious colors to choose from: Chocolate, Hot Pink ,Slate and White. Palm size IDOL 2 MINI and IDOL 2 MINI S with 4.5” screen size is pack with innovations of One Finger Zoom and 4G LTE experience. Joining in the market, this very affordable IDOL 2 MINI would complement your style with four colors to choose from: Full White, Hot Pink, Cloudy and Slate. IDOL 2 MINI S won’t compromise your style coming out it Full White, Slate, Cloudy and Chocolate shades. Don’t just stop with the ALCATEL ONETOUCH innovative and sleek phones, add more style and maximize the experience with handy accessories. Keep notified with a Boom Band, keep your phone protected with translucent Gel Skin and Sight FlipCase, and keep in style with AeroFlip Case that lets you see your notification and music playback through its transparent window. Keep in style, be on the go, and enjoy the 4G LTE ultimate experience without making your pocket bankrupt, choose the ALCATEL ONETOUCH range.